I have lovely vegetarian chili simmering on my stove at the moment. No, not raw chili (is that even possible?) but it IS very healthy. Nothing unhealthy whatsoever is currently in the chili, and nothing unhealthy will make its way into it either! The idea that comfort food--especially chili--has to be unhealthy is ridiculous. Even if I were making chili with meat, there is still no reason it can't be healthy! I pigged out on kale chips last night. I bought a huge bunch of kale from the farmer's market on Saturday, way more and way fresher than I would be able to get from the supermarket, for the same price!! I made two entire dehydrator trays worth, and inhaled them in no time flat. Then they were all gone... So sad. Pre-heat the oven to 150F. In a bowl, massage the sea salt, olive oil, and nutritional yeast onto each piece of kale. Spread evenly on a cookie sheet, making sure to not allow kale to overlap. Chips will be done in ABOUT an hour, so make sure you keep checking them. They're done when they're crispy. I made a zesty tomato cracker recipe that I found on Karen Knowler's site, but I didn't care for them. Not surprising really, since I loathe tomatoes with the passion of 1000 hells, but I thought maybe they'd be OK if they were sun dried tomatoes, which I can take sometimes. But nope, I loathed them too. It had nothing to do with the quality of the recipe, and they turned out just as they should, I just didn't like them. I also went to the Donkey Sanctuary yesterday! I've been wanting to go for a while--since it opened to the public, really--but never got around to it. I'd never met a donkey in real life before! I'd seen them lots of times of course, but never up-close-and personal. It was so cool! 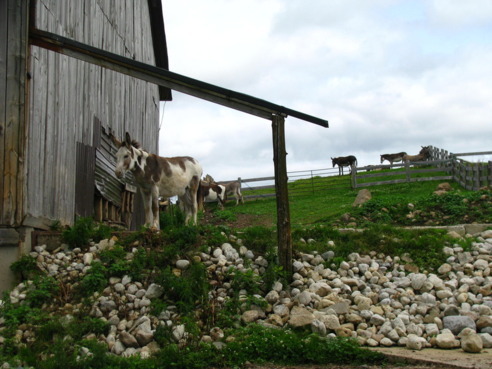 There are about 100 animals there, the vast majority of which are donkeys. Some of them are so friendly that they're allowed to just wander around in amongst the visitors. At one point I was sitting on a stump, and one of them came right up to me (he was BIG! ), and rubbed his nose on my knees. It was like he and I had been friends for years lol. So of course I rubbed his ears (they love to have the inside of their ears rubbed) and caressed his face. They've very sweet--I had no idea they were so amazing! I'll never think of them as "just" donkeys again!